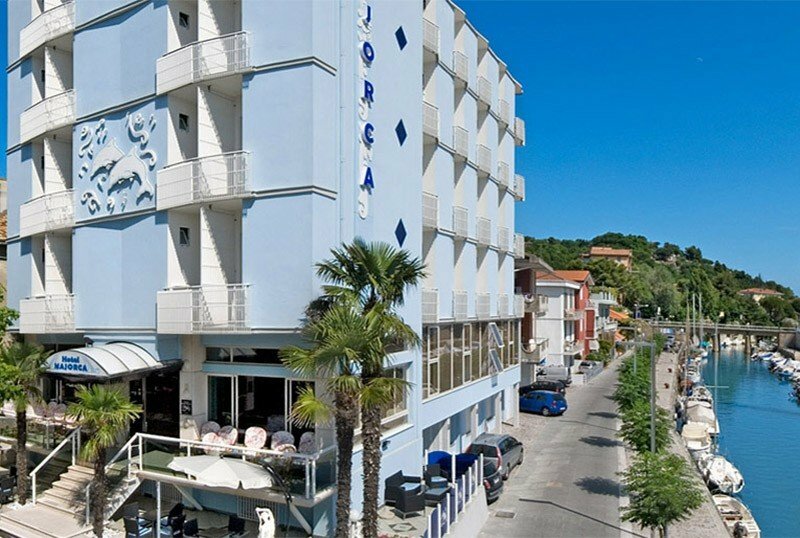 In the heart of Gabicce Mare the Hotel Majorca offers its guests: parking space, WI-FI connection, air-conditioned rooms, affiliated bathing establishmentses and sun terrace. Pets Allowed. The hotel is located a few tens of meters from the beach, reachable in a few steps, right in the center of Gabicce on the Gabicce waterfront, in the city center and a few steps from the sea. All rooms have a ceiling fan, time zone air conditioning, WI-FI, safe, bathroom with shower and hairdryer. BREATH ROOMS: they measure 15-19 square meters (single 12 square meters) and are suitable for up to 4/5 people. Located on the top floor of the hotel and recently renovated, they have a balcony, laminate / parquet flooring, box spring beds, a minibar, a 32 "LCD TV. Suitable for couples or families. In this case, there is a double bed and one castle or two singles No pets allowed. NEW BREATH ROOMS: large 15-19 sqm (single 12 sqm), can accommodate up to 4/5 people. They are the novelty of 2019, located on the 3rd floor of the hotel, with laminate / parquet flooring, 32 "LCD TV, balcony, minibar. These rooms are suitable for couples and families (with bunk beds or 2 single beds). No pets allowed. SUITE ESCAPE: measuring 28 square meters, is located on the 3rd floor and is designed for a romantic or family stay in a refined and relaxing environment. It has laminate / parquet flooring, round bed, double sofa bed, 40 "LCD TV, Tea and Coffee maker, minibar, courtesy set, balcony, 2 designer bathrooms with shower cubicle and hairdryer. It can accommodate up to 4/5 people and the sitting area can become a double bed.No pets are allowed. SUN ROOMS: large 15-19 sqm (single 12 sqm), are located on the 1st and 2nd floor and are very bright. They can accommodate up to 4/5 people and have a ceramic floor, 19 "LCD TV, balcony. The family rooms can accommodate a bunk bed or 2 single beds. Small and medium size pets are allowed. QUIET ROOMS: 16 sqm rooms for up to 4 people. Quiet without balcony, with ceramic floor, 19 "LCD TV, bathroom with shower and hairdryer, safe. NEW QUIET: rooms of the "Quiet" type but renovated, with laminate / parquet flooring, 32 "LCD TV, minibar, safe. Garden open-air porch, bicycles available, entrance without stairs, living room with TV room, lift, bar, large sun terrace on the top floor, equipped with deckchairs, beach umbrella, shower and beach towel in use. PARKING: covered and uncovered, in hotels with limited places. Other covered places, 300 mt from the structure. SERVICES FOR DISABLED PEOPLE: lift according to law. PETS: small and medium size admitted, but not in the dining room. BREAKFAST: buffet with homemade cakes and desserts, biscuits, jams, cereals, cheeses, cold cuts and much more. LUNCH AND DINNER: choice of menu with meat and fish dishes every day, followed by a buffet of vegetables, appetizers and appetizers. VARIATIONS: vegetarian cuisine; dishes for celiacs on request. In hotel: indoor and outdoor playground area, strollers, baby sitter and pediatrician on request. Animation during meals. In the room: cots, camping beds, bed rails, bath tub. At meals: seats at the table, bottle warmers, flexible hours, baby menus, baby food and baby food. On the beach: baby / mini / junior club with entertainment and games. The hotel has an agreement with two establishments, Bagno n. 14 and the Baths n. 7-8, both close to the hotel, offering: entertainment for children and adults, games, baby sitting, aquagym, muscle awakening, volleyball court, bocce court, table tennis, gym and reading area. For minimum stays of 5 nights from 19 May to 16 June, from 27 July to 4 August and from 1 to 15 September 2019. If you've waited a whole year to be able to give you a nice beach holiday with the whole family ... it's finally time to leave and turn the dream into reality! Pack your bags: Gabicce Mare and the Majorca Hotel are waiting for you! From April 25th to August 4th and from August 27th to September 16th 2019, families of 2 adults + 2 children up to 14 years pay only 3 units instead of 4! Special Bridge of May 1, in Formula B & B starting from € 20.00 per person per day. huge private parking under the Hotel. Ask for a free personalized quote. Ready go! Summer has finally arrived! Take advantage of our May and June offer. Hurry up and book now our sensational July offer! Contact us for a free personalized quote. Check out our best offer in August and book it to guarantee you a front row seat on the beach! Ask for information and a free estimate.